A task construct generates a task, which is executed by the specified nodes. A tasks construct asserts that surrounding task constructs can be executed in parallel. This page shows some examples of the task construct other than those in Tutorial (Global-view). The on clause of the task construct specifies the node set that executes the task. 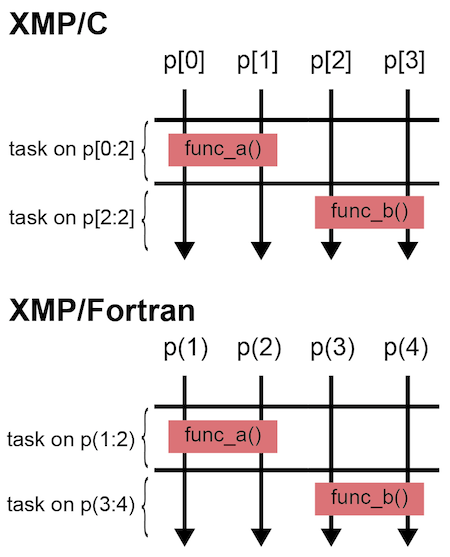 In the above example, nodes p, p, and p execute the printf() function and p outputs “1: Hello” in XMP/C, and p(2), p(3), and p(4) execute the write statement, and p(2) outputs “2: Hello” in XMP/Fortran. Note that a new node set is generated by each task construct. Consider inserting a bcast construct into a task. This bcast construct is executed by the node set specified by the task construct. Thus, the node p broadcasts the value to p and p in XMP/C, and p(2) to p(3) and p(4) in XMP/Fortran. The bcast construct in the above code is equivalent to that in the following code, where it is executed by a new node set that is explicitly declared. Note that the task is executed by the node set specified by the on clause. Therefore, xmpc_node_num() and xmp_node_num() return the id the node set. For example, consider inserting xmpc_node_num() or xmp_node_num() into the task in the first program. 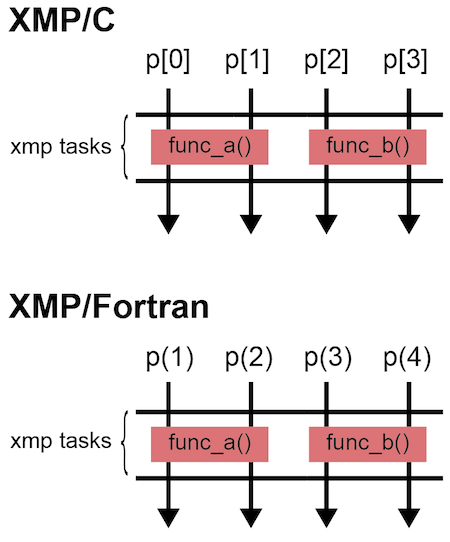 The node p outputs “0: Hello” in XMP/C and p(2) “1: Hello” in XMP/Fortran. A new node set should be collectively generated by all of the executing nodes at the point of task construct unless it is surrounded by a tasks construct. 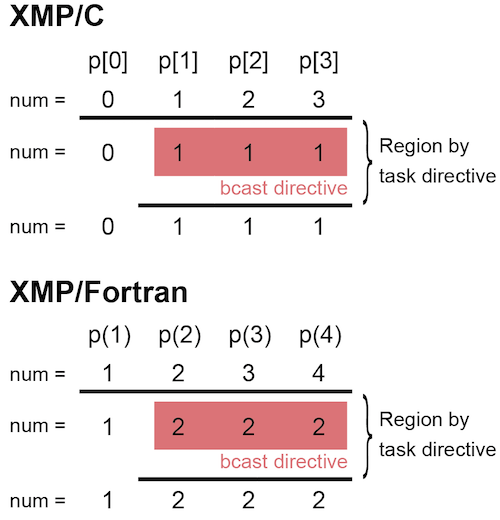 In the above example, p in XMP/C and p(1) in XMP/Fortran must execute the task construct. Consider that each of two tasks invokes a function. In the above example, the two tasks cannot be executed in parallel because those on clauses must be evaluated by all of the executing nodes. Use the tasks construct to execute multiple tasks in parallel. The node sets specified by the on clauses of task constructs surrounded by a task construct can be executed in parallel.